I recently attended a very interesting workshop hosted by The Perfume Society so I wanted to post a little about that and also to talk a bit about my own personal perfume collection. You can read my original post about The Perfume Society here, which outlines what the Society is all about and how you can join. One of the fragrances that we discussed was Chloe by Chloe which is one that I wear, and there was considerable consensus that this was a fresh, floral fragrance with a vintage feel to it. Perhaps this is why I like it so much! It's very feminine, and it evoked the colour 'blush' or pale pink to many of the other 'noses' around the table. The colour of the ribbon around the neck of the bottle depicts just the sort of colour this fragrance seems to represent, so it would seem; one wonders how much this was taken into account when the fragrance was being designed. We were all encouraged to bring our favourite fragrance and to talk about what it was we liked about it. I brought Karma by Lush as this is the one I wear through all of the winter months. It's quite spicy, slightly heady and a little hippyish; I had never smelled anything like it before and I always, always get comments on it when I wear it. I have the spray bottle and also the small solid perfume which is really useful for keeping in my makeup bag; it used to come in a stick form which was much better that this pot version but unfortunately this is the update-Lush, please, go back to the stick form! We got to talking about our perfume collections and sizes ranged from the enormous (150 perfumes) to the minimal (one perfume) and everywhere in between. I am definitely at the lower end of the scale with just three fragrances, two of which I only usually wear in the summer-Bronze Goddess is my favourite high-summer fragrance as it smells like a holiday in a bottle and it always reminds me of the beach and being away. The last two bottles of this that I've had have been gifts from my mum for Christmas which is lovely because then I have my favourite summer scent to wear all season long. The Chloe signature fragrance is a really pretty, feminine scent that I have wanted to get for years, but it is so ridiculously expensive. I ended up finding the last gift set in my local John Lewis when there was a 30% off event so I got this 50ml size and a body lotion for £44. When you consider that the 50ml of the perfume alone is £65 this is a fairly good saving so I did finally pick it up! Again this is quite a light scent so I would tend to wear this more during the summer months when the Karma scent is a little too heavy. 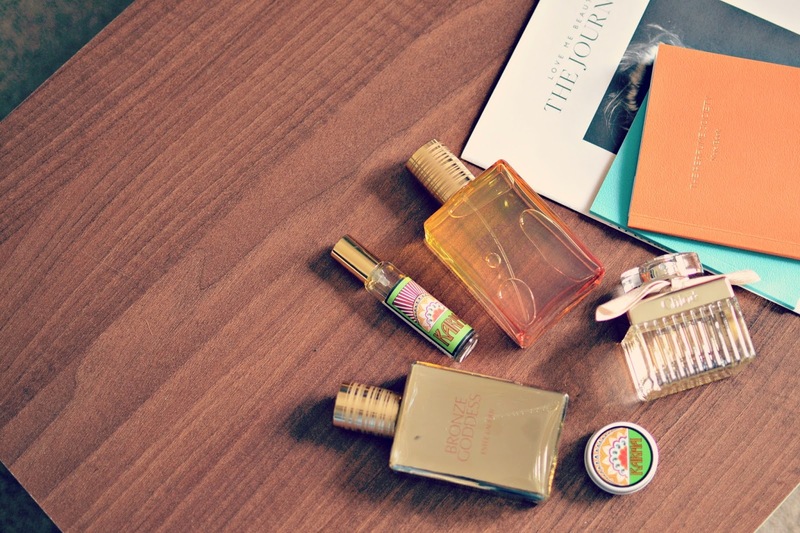 How many perfumes do you have in your collection? Do you have a signature scent?